I have been researching the Greenwich Village folk scene for a couple months now, and I’ve run across multiple articles that compare folk singer Dave Van Ronk’s memoir, The Mayor of MacDougal Street, to Joel and Ethan Coen’s 2013 film Inside Llewyn Davis. While I’m no ethnomusicologist and my musical career didn’t last past high school, I thought I’d share my own interpretation. Warning: spoilers lie ahead. From the outset, there are clear parallels that show Van Ronk helped inspire Davis. Both went to Chicago to unsuccessfully audition at the Gate of Horn, and both wanted to return to work on a merchant ship but found they had lost their papers. Van Ronk was also asked to join a trio (what would become Peter, Paul, and Mary) but turned it down to continue his solo career. Davis’s solo album Inside Llewyn Davis was based off of Van Ronk’s 1964 album, Inside Dave Van Ronk. Similarly, the Greenwich Village in the movie was very similar to the Greenwich Village in the memoir—The Gaslight Café and Café Figaro both played important roles in the growth of folk music during the period. I thought Van Ronk’s writing most strongly shone through in the movie’s soundtrack. Throughout the memoir, Van Ronk emphasizes that what was considered folk music in the sixties was really a combination of different styles, techniques, and genres. Musicians took chord progressions, fingerings, and even entire songs from one another. Admittedly, this type of collaboration greatly waned as folk music became more profitable. But Van Ronk, ever a purist, acknowledges the importance of taking inspiration from others. Most of the songs on the soundtrack are re-interpretations of songs performed by 1960s folk singers (which were often re-interpretations themselves). I thought this was an important stylistic decision by the Coen brothers—by having contemporary musicians play the songs instead of using old recordings, the movie is essentially demonstrating what Van Ronk so passionately describes. The music captures a key aspect of the 1960s folk revival, and Davis acknowledges this during a performance when he says, “You’ve probably heard that one before. It was never new and it never gets old, and it’s a folk song.” Van Ronk would adamantly agree. Llewyn, Jim, and Jean listen to a performance at the Gaslight Café. Folk musicians certainly struggled to find success in the 1960s, but Davis seems to have a deep-seated bitterness that didn’t come out of Dave Van Ronk’s memoir. The storyline of Mike, Davis’s old partner who committed suicide, greatly influenced Davis’s actions—it drove his anger against Mrs. Gorfein and his feelings about “If We Had Wings.” Van Ronk does not discuss any musician facing a similar experience. Davis is much less successful than all the other musicians in the film—he sleeps on people’s couches, struggles with gigs and record sales, and never has money. In reality, most musicians, Van Ronk included, similarly lived day to day. It was an exhausting business that until later in the 1960s, had very little money to share. But by juxtaposing Davis with characters like Jim and Jean, Davis appears to be the sole failure. While the sixties were difficult for Greenwich Village musicians, there was also a lot of camaraderie and fond memories that I think were excluded from the film to exaggerate the plot. To me, the memoir and movie most strongly diverge in their purpose. Van Ronk was a few years older and gained a group of followers before the real folk wave hit. He spent the majority of his life in Greenwich Village, and his success and experience made him a mentor for new musicians travelling to the city (it was a bartender at the Kettle of Fish, a popular restaurant for musicians, who named Van Ronk “the Mayor of MacDougal Street”). This perspective, plus historical hindsight, allowed Van Ronk to write a memoir that represented not only his life but also folk musicians more broadly. 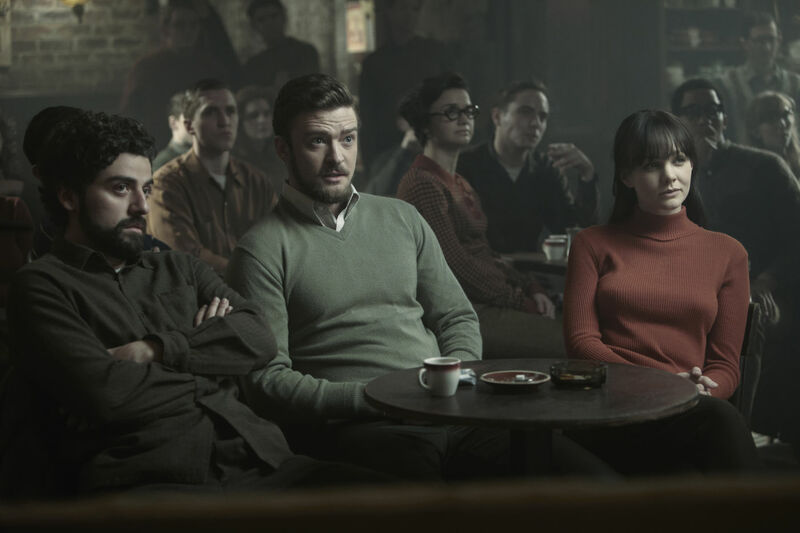 Llewyn Davis, however, followed one person; the differences between Davis and the other characters made his story singular. This is neither good nor bad, but different. Any good researcher developing this screenplay would have read The Mayor of MacDougal Street, and it does provide content for the movie. But to say there is a larger connection, or that Davis is based off of Van Ronk, would in my opinion be an exaggeration. To read more about Dave Van Ronk and Inside Llewyn Davis, check out this Rolling Stones article and this piece by Terri Thal, Van Ronk’s ex-wife from the sixties. Plus, if anyone can get their hands on the radio broadcast of “Folkplus,” hosted by Angela Page, during which she interviews Andrea Vuocculo, Elijah Wald, and several others who personally knew Van Ronk, please let me know. David Lerner’s Dry Manhattan: Prohibition in New York City, is a great overview of prohibition in New York City. It provides the reader with a great analysis of the effect that the temperance movement had on the city. One great part of his book focuses on the effects that prohibition had on immigrant communities. Prohibition effected the entire country, but it was really seen as a major affront to a city as diverse as New York City. Lerner does a good job at exposing some of the bigotry that was tied to the temperance movement. For some members of the movement, alcohol and immigrants were synonymous. Banning alcohol was an underhanded way of trying to ban ethnic traditions from the United States. Researching prohibition was interesting since I go to read about a scandalous part of US history, but it was great to also read about how this movement effected working class immigrants in New York City. I definitely recommend this book as a great way to learn about the politics and social climate surrounding prohibition. A young couple came toward them, carrying the Sunday papers. Rufus [African-American] watched the eyes of the man as the man looked at Leona [white]; and then both the man and the woman looked swiftly from Vivaldo [white] to Rufus as though to decide which of the two was her lover. And, since, this was the Village–the place of liberation–Rufus guessed, from the swift, nearly sheepish glance the man gave them as they passed, that he had decided that Rufus and Leona formed the couple. The face of his wife, however, simply closed tight, like a gate (29). Baldwin is skeptical of the Village; in his hands, the neighborhood takes on a sinister cast. Rufus and Leona come to tragic ends. Another Country is excellent for many reasons, but might be of particular interest to our class because of the Village setting. It may or may not be more realistic, but it certainly provides a different perspective from what we may have been reading. I’m going to guess that most of us have been trying to get enough of a grasp of the boundaries of copyright in order to be able to adequately address the rules governing our use of documents and images in our final projects. Some of us may have even gone a step farther and attempted to understand why things are the way they are when it comes to copyright. If so, irritation and/or dissatisfaction was probably encountered. One of the most interesting and satisfying books on copyright for me has been ‘Shamans, Spleens and Software’ by James Boyle. A law professor at Duke University and a leading expert in copyright theory, Boyle takes a different approach from a lot of other experts on copyright law. Instead of doing the usual thing of presenting a narrative about case histories (or worse), he goes back to the historical moment when copyright came into being. According to Boyle, courts were struggling to define a way to attach property values to works of creativity when they settled upon the romantic notion of the author as the organizing concept with which to sketch out this copyright thing. Unfortunately, there was a problem. Although it helped conceptualize a new kind of right that resides with some individual or individuals and can be transferred, it divorced itself from an earlier understanding of authorship, one that predates the printing press and was common when the writer of a book was merely one member of a creative team that handcrafted books together. This, says, Boyle is at the heart of the very narrow definition of creativity that always demands that, regardless of the work or creation, the “author” be identified and endowed with exaggerated notions of originality and discovery. Boyle argues that this notion of the romantic author continues to be at the heart of contemporary copyright, and the shamans, spleens, and software in the title refer to some fascinating, but terrifying illustrations he presents showing the consequences with which we continue to live. This thesis if from 1988 and is about the history, evolution, and prospectus for change of the park, with each subject getting it’s own chapter. It was completed for a Master of Landscape Architecture degree, and although it might seem like this thesis focuses on the physicality of the park, as you read you soon find out that the physical and social aspects of the park are inseparable. This is therefore a clear mapping of how the park has physically changed and an enlightening on the social history of Greenwich Village for which each manifestation of the park was created. Shoenbaum concludes that it would be in the public’s best interest if the park were restored to its historic form modeled after the parade ground with widened pathways and more direct walkways. She also suggests that the fountain should be moved to align with 5th Avenue — as most of you this was done just last year. I enjoyed this thesis in light of the redesign currently happening to the park right now, and I’m interested to see how it will match up to Schoenbaum’s suggestions. Schoenbaum, Laura Helene. Manhattan’s Washington Square Park: its history, evolution, and prospects for change. Cornell University: Thesis (M.L.A. ), 1988. This resource is great because it was written by those who were there and when the events were still fresh in the news. The History of the Washington Square Arch. New York, NY: Ford and Garnett Publishers, 1896. Been thinking about the immigrant past of the city, and in particular that of the Village, which in turn got me to thinking about the former German enclave of Kleindeutschland (Little Germany) in what is today the East Village. There are still architectural remnants left such as the German Dispensary and Library on 2nd Avenue, but for the most part the German legacy has been erased by successive waves of subsequent immigrant populations, most notably from Eastern Europe. Some historians see this as the natural cycle of immigrant populations moving out of urban tenements once they attain a level of prosperity and respectability. In the case of Little Germany, however, some link it directly to the General Slocum disaster of 1904, in which a fire engulfed the charted steamship killing over 1,000 members of the St. Mark’s Lutheran Church. The Slocum fire was the single largest loss of life in New York until September 2001. According to some statistics, within a year of the fire nearly 28% of the families involved had moved out of the neighborhood, many to Yorkville on the Upper East Side. By 1910, the Little Germany of the Lower East Side was essentially no more. 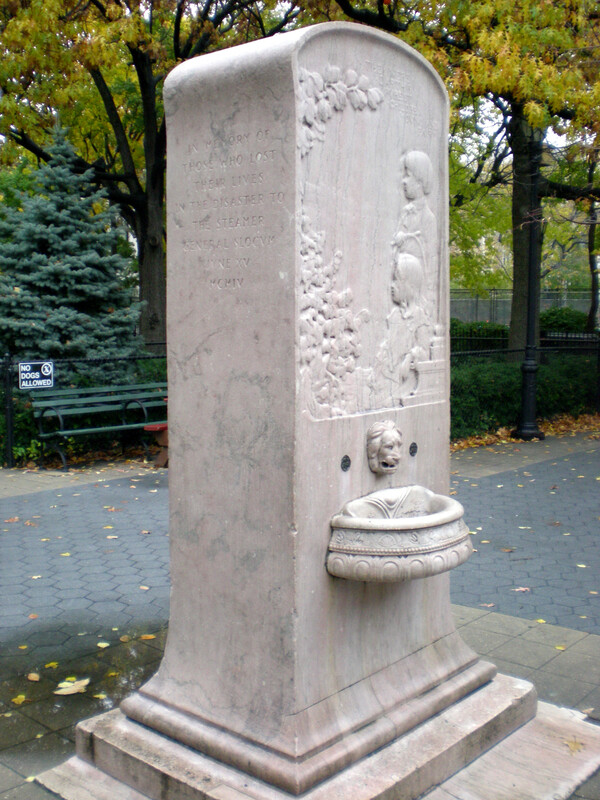 There is a monument to the Slocum disaster in Tompkins Square Park and St. Mark’s is still on 6th Street, though it became a synagogue in 1940. For a more detailed account check out the book Ship Ablaze by Edward O’Donnell, which is based largely on firsthand accounts, primary sources, and interviews with survivors.